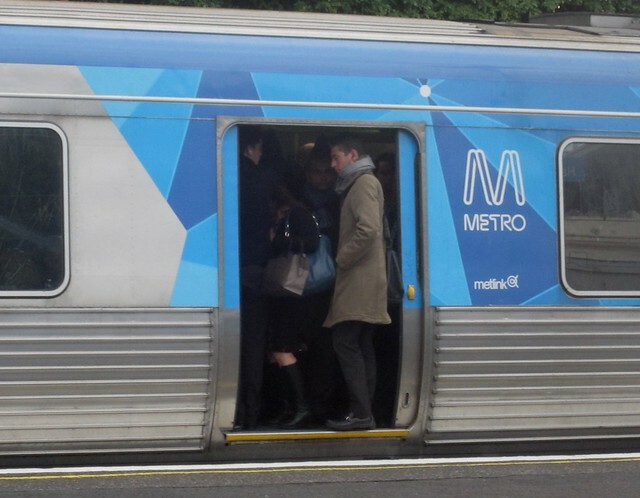 The last state election swung on public transport — both sides said so — specifically on the perceived lack of action from Labor on fixing the trains, resulting in delays, cancellations and sometimes horrendous overcrowding. I hasten to add it’s not every train that’s this packed. It appears to be a combination of issues: firstly delays to inbound peak trains on the Dandenong line, resulting in crowding — particularly the 7:53 from Cranbourne (8:37 from Malvern). Possibly the train beforehand is on-time or cancelled. Secondly, poor information at the MATHS stations which results in loads of people waiting on platform 3 as the train pictured arrives — despite the train from Moorabbin arriving simultaneously (on time, 8:41 Malvern) having plenty of space. Thirdly there’s poor timetabling at work here. 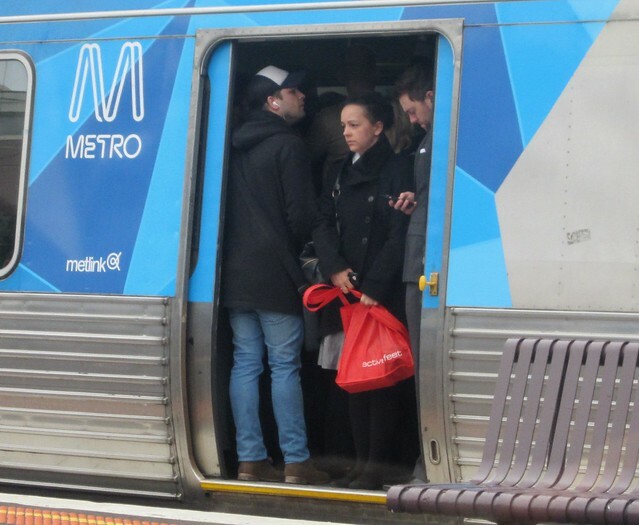 The peak timetable which nicely balances passengers between Dandenong expresses, Frankston expresses and Frankston stoppers grinds to a halt shortly before this time, despite it still being peak hour. Often people are left behind, particularly at Toorak, Hawksburn and South Yarra. I see this happening perhaps once or twice a week — it might well be happening every day but my train isn’t always parallel so I don’t always see it. Toorak, Hawksburn and South Yarra are in, or adjacent to the seat of Prahran. Prahran swung from Labor to the Coalition in 2010. Services to many stations seem to have improved since the election. But these people do not look delighted at the state of their train service. If I were current member Clem Newton-Brown, I’d be concerned about this. But what can Clem or the Government do about it? Ordering more trains has a lead time that is more than a term of government. In fact more trains are already ordered and delivery of those is out of the Government’s hands isn’t it? There is also a limit, much talked about, to how many trains can fit. Maybe not reached yet. So all Metro (and it’s Metro, not the Government that can do anything) can do is try to run as reliably as possible. Or are you hinting that just a bit of time table fiddling would fix it? Or extending the peak into the shoulder? I’d like you to go beyond hinting and propose the solution. Clem responds on Twitter: @danielbowen thanks Daniel, am working on this and will show your tweet to the Transport Minister this morning. @Nik, yes, timetable adjustments would help a lot. In case it wasn’t clear in the post, crowding occurs in part because of uneven frequencies and because already-overloaded trains stop at these stations when they arguably shouldn’t… Both occur because trains at this time break the peak hour pattern that runs from about 7:30 to 8:30 (and does a reasonable job of evening out the loads). More work also needs to be done on cutting delays. The flood of people to and from trams at South Yarra Station in the morning has to be seen to be believed at times. I use one of the MATHS stations (although only rarely between 8.30 and 9 am). Perhaps train cancellations are the cause of the over-crowding issue? But my biggest issue is the strange timetable from 4 pm onwards, right through to the last train (especially if travelling from a loop station). On top of this, it’s not unusual for a train that’s supposed to travel through the loop to run direct from Flinders St. Sometimes at Flagstaff the train just disappears from the screen without even an announcement. One curiosity about the MATH section is that some of the peak hour gaps are longer than the off-peak/weekend gaps – like nothing stops there between the 5:53pm FSS-Frankston and the 6:11pm FSS-Mordialloc trains. Think it only happens once a day now (inbound, about 8pm based on the timetables) but I’ve been on an Up Frankston before stopping all stations on one track, while an Up Cranbourne was on the other track, also stopping all stations inward of Caulfield, and both trains paralleled each other from Caulfield to the City. Seemed like a total waste for them to be stopping at every stop!! This morning there were 2 cancelled services (7:50am & 8.06am from Bentleigh). Glenhuntly (& MATH) passengers were unable to board the the service after the 7.50am, and I’m pretty confident they would have no hope of getting on the service after the 8:06am. So, these passengers were experiencing a delay of around 40 minutes in their trip to work today. 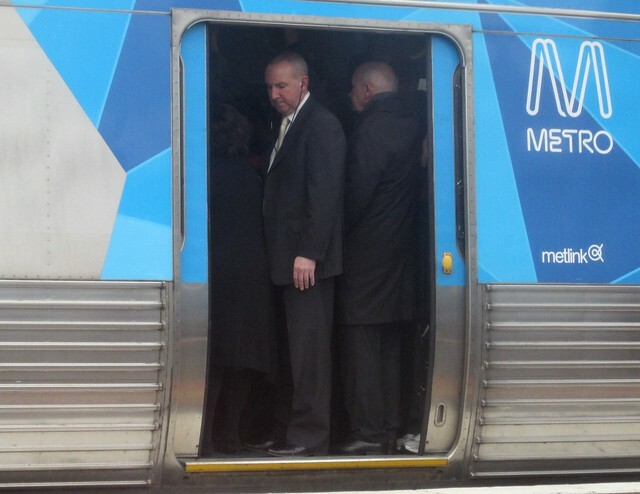 The Metro Website reported “Good Service”. The trains are packed (but still not London Tube packed) just around the door. Take the seats out of one side of the train between the doors and put up some hand rails and bum rests (like on trams) and you can fit another 50 people in each carriage.